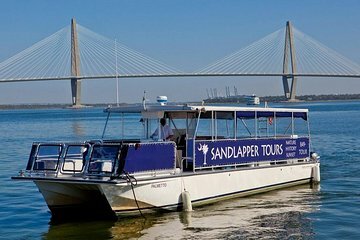 Meet your guide at the Charleston Maritime Center in downtown Charleston 30 minutes prior to departure, and check in at the blue and white ticket booth onsite. Learn the basics of onboard safety before heading out into the Charleston Harbor. This is not a narrated tour, but the captain and first mate will be available throughout the sail to answer questions and point out local landmarks. Cruise under the iconic span of the Arthur Ravenel Jr. Bridge as navigate along the scenic harbor, and enjoy an mellow playlist of music. See the Battery, Fort Sumter, Fort Moultrie and Charleston’s scenic lighthouses from the water—with unobstructed views, this is the perfect time to snap photographs of the iconic landmarks. Relax on deck for nature’s sunset show: the sun sets directly over the land, lighting up the clouds and waterfront. Soft drinks, beer and wine are available for purchase, and you’ll finish your harbor cruise back at the Maritime Center, close to some of downtowns best bars, restaurants and cafes. It was so beautiful and peaceful. Got amazing pictures and memories to last a lifetime. A definite revisit!! This was a very informative and very pretty sunset cruise. Crystal and Captain Mike were incredible and I would highly recommend them to anyone. Very hot day in Charleston was replaced with a cooling boat ride around Charleston Harbor. Relaxing, informative, and simply a beautiful couple of hours in the evening on the water. It was great relaxing cruise of the harbor, the two fort sites and the amazing old historical houses on the waterfront/seawall. While the weather didn't cooperate for the sunset, the cruise was well worth the time and money. Great night on the boat! Lee was excellent with just enough history and humor! This was a great time!!! The view of the sky was really awesome. You might see dolphins - we saw over a dozen. Captain Mike if a first class master of the seas. If you want to do something that you will remember for years to come - take this sunset cruise. Both the captain and the first mate were top notch from start to finish. It was a very relaxing 2 hours and passed very quickly. We didn't expect historical information but that was included as well. Yellow and pink sunsets were beautiful! This sunset cruise was one of the high lights of our trip. The weather was perfect and the cruise around Charleston Harbor was wonderful. Highly recommend this cruise. The staff was excellent and our tour guide was the best,.